How Is Citric Acid Made & Where Does It Come From? Every time you enjoy citrus fruits, you consume citric acid produced by nature. Your body makes its own supply because citric acid is essential for producing the energy that keeps you active and healthy. Commercially produced citric acid is added to foods, beverages and pharmaceutical products, but this type of citric acid comes from yet another source -- fermented fungi. 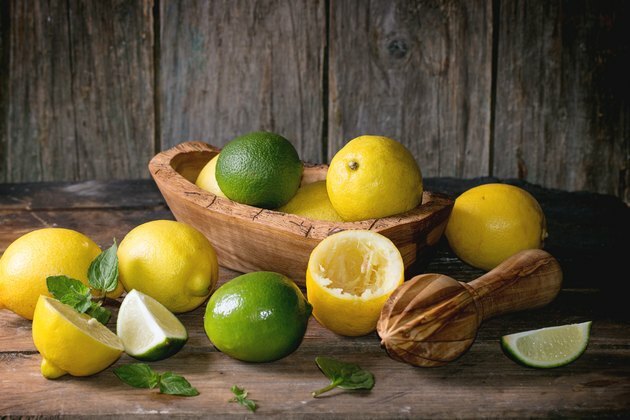 Lemons and limes are the best sources of citric acid, followed by other citrus fruits and strawberries. Up until the early 1900s, 90 percent of the world's citric acid came from Italy, where manufacturers extracted it from fresh fruits. Then researchers discovered that fungi produced citric acid during fermentation and that this process yielded a larger amount at a lower cost. A variety of yeasts and molds make citric acid, but Aspergillus niger, a mold that belongs in the same family as penicillin, is used for large-scale production. More than half of all the citric acid produced is used in soft drinks and other beverages, where it boosts flavors and adds a slightly sour taste. Citric acid also acts as a preservative and flavor enhancer in foods, including jams, gelatins, candies, frozen foods, canned vegetables and meat products. For canning foods at home, citric acid is a good additive to prevent bacterial growth. It also binds with minerals, making citric acid useful in several commercial applications. For example, your body absorbs minerals in supplements more readily when they're attached to citric acid. As a cleaning product additive, it binds with minerals in hard water, which improves the effectiveness of the soaps and detergents. Inside every cell in your body, citric acid triggers the chain of chemical reactions that produce energy. This metabolic process, the citric acid cycle, doesn't depend on getting citric acid through your diet. Your body makes all the citric acid it needs from the macronutrients you consume. While cells can synthesize citric acid from fats and proteins, they prefer to use carbs. Sugars from digested carbs convert into a substance -- acetyl coenzyme-A -- that your body turns into citric acid, and the energy cycle begins. Citric acid binds with calcium in your blood, which results in less calcium available to make kidney stones. If you have a history of calcium oxalate kidney stones, consuming plenty of citrus fruits or lemonade helps prevent stones from forming in the future. Citric acid may also break up small stones that are just beginning to form, and it lowers the level of acidity in your urine, which inhibits the development of calcium oxalate and uric acid stones, according to NYU Langone Medical Center. What Is the Difference Between Chelated Zinc & Zinc Gluconate?